PROFILE: The Independent is national morning newspaper published in London by Independent Print Limited, owned since 2010 by the former KGB officer Alexander Lebedev. It is nicknamed the Indy, while the Sunday edition, The Independent on Sunday, is the Sindy. Launched in 1986, it is one of the youngest UK national daily newspapers. The Indy has become known for its unorthodox and campaigning front pages, which frequently rely on bold images, graphics or lists rather than traditional headlines and written news content. The Independent is regarded as leaning to the left politically, making it primarily a competitor to The Guardian, even though it still features some conservative columnists and tends to take a classical liberal, pro-market, stance on economic issues. Profile extracted from Wikipedia and used under the Creative Commons Attribution-ShareAlike License. Circulation: 180,743 (April 2011) Political Outlook: Centre-Left, Liberal See our UK Newspaper Guide. 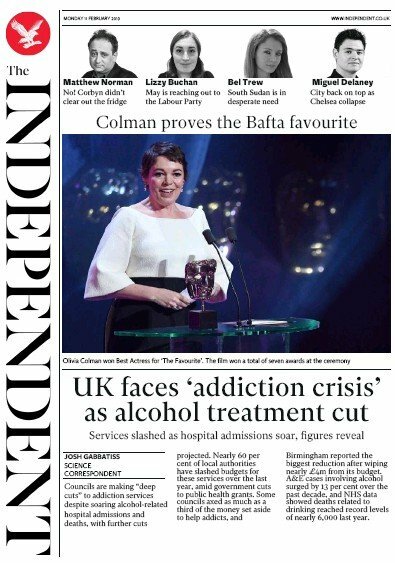 The Independent newspaper from UK is available through PressDisplay.com where you can browse and read hundreds of full content premium newspapers and magazines from around the globe. With a subscription to PressDisplay.com, users gain access to full print versions of newspapers on the day they are published.